As a comic book reader, I am very familiar with artist Joe Madueira. I’ve been a fan of his art in various comic books for years. Despite this, I never read Battle Chasers. Battle Chasers was a hugely popular comic book by Madueira in the late 90s. The comic’s issue release schedule had several delays with only about 2 or 3 issues coming out a year. I always planned to get them in a collected edition when the story was finished. Since Joe became a video game designer after publishing only 9 issues of Battle Chasers, he never finished the story and I never bought the books. After meeting the characters in my play-through of Battle Chasers: Nightwar, I plan to finally read it. Battle Chasers: Nightwar is an RPG by Madueira’s new company, Airship Syndicate. If you’re not familiar with Joe, his character designs and art-style feel like a cross between American comics and Japanese anime. If you are, this game won’t let you down as Nightwar truly feels like a living Madueira comic book. Joe draws the characters and world of Nightwar beautifully, and the cutscenes are comic book panels. Nightwar plays a lot like the traditional JRPGs that I grew up playing. It brought back fond memories of the many hours I put into the Dragon Warrior and Final Fantasy games on my NES in the 80s. In those classic JRPGs, you travel the world via a top-down map while moving between dungeons and towns. Nightwar, however, eliminates the annoying random encounters of those classics. Instead, you see all enemy encounters on the map, allowing you to prepare in advance. The over-world map of battle chasers is not fully open as is typically the case with this type of game. The map in Nightwar looks a little like a board game. There are paths that you must move along, so you cannot completely avoid battles or navigate around enemies. The game requires some battles if you want to continue down a particular path. Luckily, the battles in Nightwar are a blast. Nightwar’s battles are turn-based affairs that will feel very familiar to fans of old-school JRPGs. There are a few small additions, like a burst meter, that allow characters to pull off devastating moves. There’s also an overcharge gauge which gives you additional mana for special attacks. Nothing particularly ground-breaking shows up in the battle system. You’ve probably seen systems like it before. However, that doesn’t prevent the game from being very fun and, at times, extremely challenging. The number of moves each character has available means that there are various ways to approach each fight. But watch out, the enemies themselves have many tricks up their sleeves. Nightwar randomly generates the dungeons. This means once you have beaten a dungeon, you can choose to start it again and experience something vastly different. There are certain parts of each dungeon’s layout that are the same each time because of the story elements involved. However, there are still surprises to find with each fresh play-through of a dungeon. When you enter a dungeon for the first time in Battle Chasers, you choose a difficulty. The normal and hard difficulty will give lower level rewards, but if you die you are able to reenter the dungeon with your previous progress intact. Beating the dungeon on either of these levels unlocks the legendary difficulty. Legendary difficulty gives the best rewards, but if you die on this difficulty, the dungeon resets and you must start again. I didn’t replay dungeons a lot of in Nightwar, but about halfway through the game the difficulty spiked and it became a temporary necessity. Around the time my characters hit level 14, I found I wasn’t able to make any progress and needed to replay a couple dungeons in order to level up my characters. I continued to struggle for a few levels. Just as the game started irritating me with the grind, I figured out a party combination that worked better for my play-style. The new combo meant I was able to push forward in the story. It’s essential to choose the right skills for each character and develop a party with complimentary abilities to defeat the second half of Nightwar. 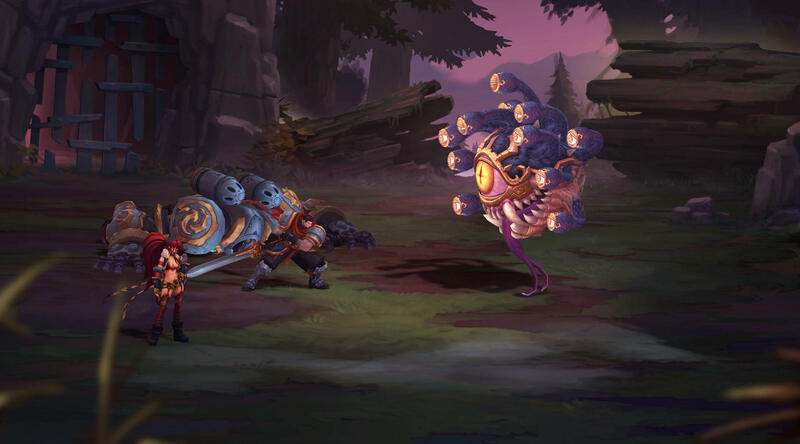 There are a total of six characters in Battle Chasers that you can choose from when building your three-man party. Five of the characters are from the Battle Chasers comics: Gully, Garrison, Knolan, Calibretto, and Red Monika. The last character, Alumon, is a new character he created just for this game and wasn’t all that interesting. You won’t have access to all six characters until partway through the game. A player unlocks them through story progression. Each character has two sets of skill trees, which allows some flexibility in how you want to play them. You can change skill choices at any time. Calibretto, for example, is a giant mechanized golem who puts skill points into either healing or tanking. 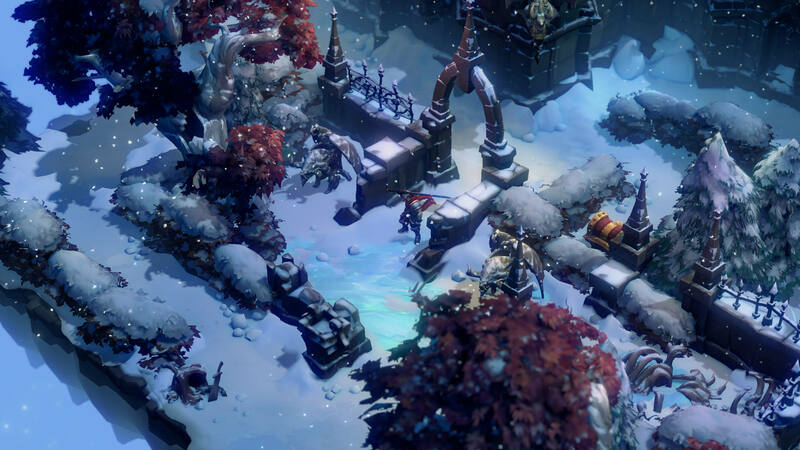 Playing Nightwar was an interesting way to meet the five main characters of the Battle Chasers comics, but it ends up feeling like you’re playing a side story in a much more interesting plot. You get a taste of each character’s backstory and motivations, but the events of Nightwar feel like a bump in the road on their grander adventure. In the end, I just didn’t care all that much about the events taking place in the game. It’s a shame since the characters, with the exception of Alumon, are so interesting. 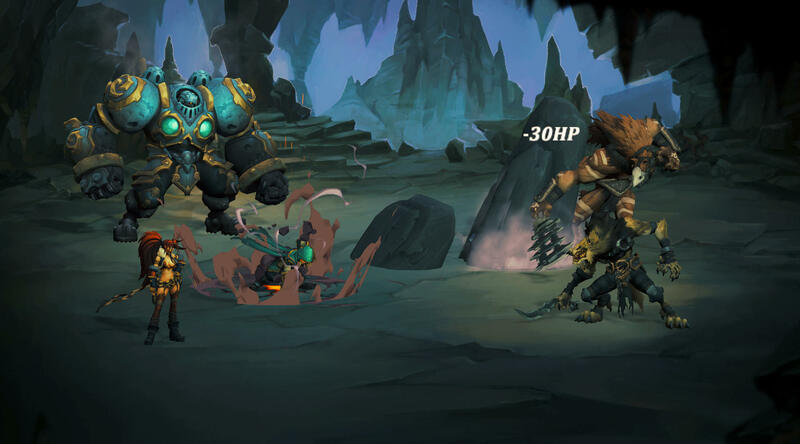 Battle Chasers: Nightwar is a fun, modern take on the classic JRPG formula that suffers slightly due to the vanilla story. Fans of Joe Madueira’s art won’t be disappointed by his beautiful hand-drawn graphics. The meaty and fun game beneath satisfies fans of classic JRPGs. 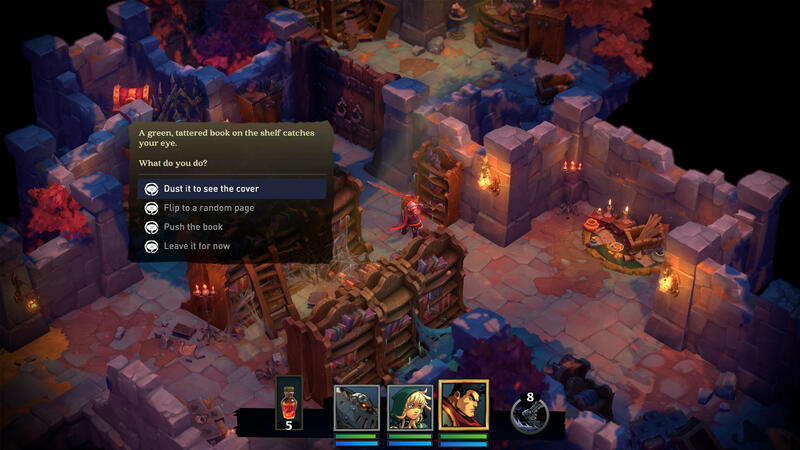 NOTE: The PS4 version of Battle Chasers: Nightwar was played on a PS4 Pro for this review. Battle Chasers: Nightwar is also available right now for the PC, Xbox One, and Nintendo Switch. Corey spent 48 hours playing Battle Chasers: Nightwar, completing the main story and every side quest he found.